Turkey purge has reached a new high with government supporters openly targeting people with the alleged ties to the Gulen Movement, which President along with top state officials accuse of masterminding the failed coup attempt. “Dear Altındağ District Director of Education Şefika Biçer, Murat Şen who was appointed by you has turned out to be pro-FETÖ. All people you brought to this district and appointed as school principals have turned out to be pro-FETO. 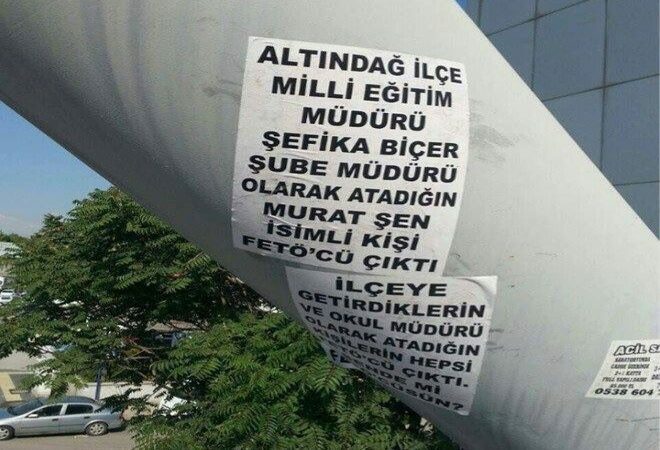 Are you also pro-FETO?,” read two banners hung on a pole in Ankara’s Altındağ district. FETO is an abbreviation coined by President Recep Tayyip Erdoğan in order to describe the alleged terrorist network of Gulen Movement within state institutions.